我把桌子的位置换了， 本来是 打直的， 现在是横的， 和我的床并排。风水师说必须这个位置， 所以我只能在这个地方换pattern. He...he... I never make my bed! WOW.... it's so comfortable & 'dreamy'... It's like a dream come true room for me. What a lovely space! I want that piggy! 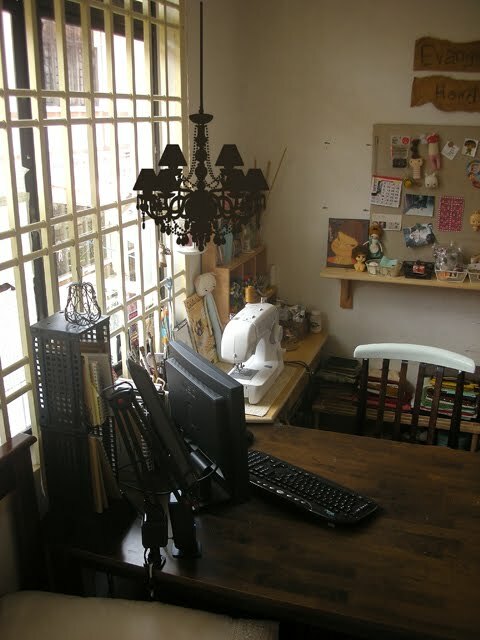 Hi, just pass by n c ur room~ I find that ur bed might too close to ur tabble, as a handcraft maker, i think u might often get the table full of material, beware those unwanted drop at ur bed is no good for ur health~ Otherwise, i like ur table very much!! wow! your working space is so tidy and organised! i love the little sad piggy. It's so cute! love all your creations! keep it up! I love your room! It's so dreamy and I totally love it! 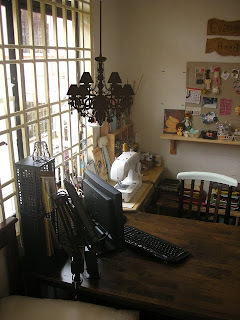 Wait till you see my workspace... hahaha, I get lost in it sometimes :-). Love all your work too... kampatei! :-D.
I am still new in the handmades scene. Have alot to learn from all of you! Love all your handmades, so full of feeling, and emotions... not everyone can make something that has a 'life' of its own.